Request received from UNDAC Team (United Nations) in Kassala (Sudan), August 18, 2003. Emergency mode engaged under mandate of the Canadian Space Agency on August 19, 2003. RADARSAT-1 radar imagery successfully acquired over Sudan/Eritrea by the Canadian Space Agency and Radarsat International on August 24, 2003. 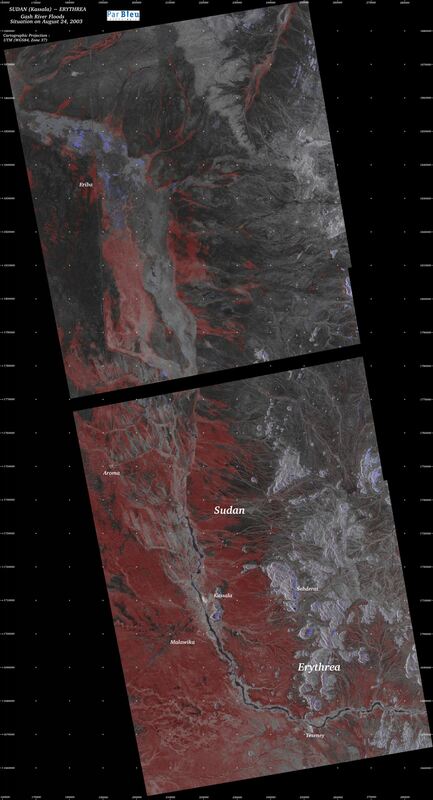 RADARSAT-1 radar images received by PARBLEU Technologies Inc. on August 26, 2003. Processing of the RADARSAT-1 radar imagery and production of damage assessment maps completed by PARBLEU Technologies Inc. on August 28, 2003. First high resolution damage assessment maps made available on-line on August 28, 2003. Additional high resolution damage assessment maps added within the next day, August 29, 2003. Operation completed : August 30, 2003. 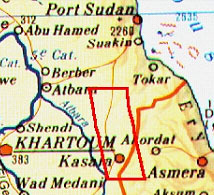 Surveyed area indicated in red. The area that has been surveyed extends over 240 x 130 kilometers. All speckle filtered images and damage assessment maps (processing by ParBleu Technologies Inc.) are produced in cartographic projection UTM WGS 1984 (Zone 37 P/Q), and at a spatial resolution of 20 meters x 20 meters. On all maps, crosses are spaced every 10 kilometers, at UTM coordinates that are a multiple of 10000. On these maps, the areas exhibiting blue tones (with the exception of the mountain areas) correspond to the areas that have been flooded. The areas exhibiting red tones correspond generally to soils presenting a strong excess in moisture content. Agricultural fields located within such areas are likely to be heavily damaged. In this region, such areas may be particularly favorable to the proliferation of moquitos and to the emergence of associated diseases. On the shores of the river, areas exhibiting red tones can also correspond to sedimentation, and light blue tones can correspond to eroded terrains. Urban areas exhibiting blue tones correspond to damages suffered by housing. In particular, see Teseney (Eritrea). Areas exhibiting grey tones are those which have not been affected by the rains and the floods. The map below is a medium resolution damage assessment map (spatial resolution of 80 meters x 80 meters) of the overall area monitored by the Canadian RADARSAT-1 satellite. Wherever the option is available, click on your area of interest to get a detailed close-up view at a spatial resolution of 20 meters x 20 meters. Procurement of the original RADARSAT-1 SAR data: Canadian Space Agency, and Radarsat International Inc. Original RADARSAT-1 images: Copyright Canadian Space Agency / Agence Spatiale Canadienne, 2003.